THE B-MOVIE NEWS VAULT: STOCK YOUR VAULT: New DVDs & Blu-rays for 04/04/2017! STOCK YOUR VAULT: New DVDs & Blu-rays for 04/04/2017! Welcome to April Vault Dwellers! Not sure how the weather is in your neck of the woods, but we're getting plenty of those accursed "April Showers" here at Vault HQ. Unfortunately, we're not also being showered with awesome genre titles, because this week's release slate is pretty slim. Scream Factory leads the pack with Blu-ray and DVD releases of INVASION OF THE BEE GIRLS and TANK 432, Mill Creek Entertainment serves up an awesome trio of films on a cheap Blu-ray set (which includes BROTHERHOOD OF SATAN, TORTURE GARDEN, and THE CREEPING FLESH), and Disney quietly debuts ROGUE ONE: A STAR WARS STORY on Blu-ray, DVD, and digital! 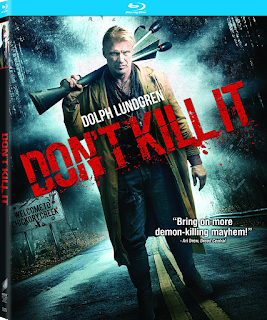 There's a few other cool titles worth investigating (like DON'T KILL IT, starring Dolph Lundgren!) so scroll on down to see the full list of this week's new DVDs and Blu-rays!